Pioneers in the industry, we offer latex veterinary gloves, red veterinary gloves, pe veterinary hand gloves, veterinary arms gloves and full arm veterinary gloves from India. Being the leading manufacturer and supplier, we offer a wide range of Latex Veterinary Gloves, which is widely used for varied purposes. 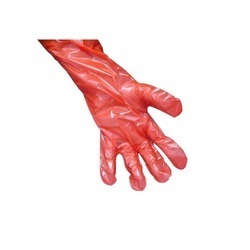 These gloves prevent the hands against contamination. Our range is available in numerous shapes and sizes along with customised patterns. These gloves are disposable in order to avoid any kind of harm to the environment. Customers can avail our range at industry leading prices. Being the leading manufacturer and supplier, we offer a wide range of Red Veterinary Gloves which is widely used in Hospitals, labs, Colleges, Packaging of Chemicals. These gloves prevent the hands against contamination. Our range is available in numerous shapes along with customized patterns. 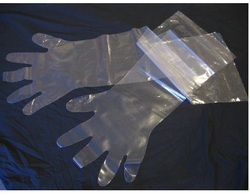 These gloves are disposable in order to avoid any kind of harm to the environment. Being the leading manufacturer and supplier, we offer a wide range of PE Veterinary Hand Gloves, which is widely used for varied purposes. These gloves prevent the hands against contamination. Our range is available in numerous shapes and sizes along with customised patterns. These gloves are disposable in order to avoid any kind of harm to the environment. Customers can avail our range at industry leading prices. Being the leading manufacturer and supplier, we offer a wide range of Veterinary Arms Gloves, which is widely used for varied purposes. These gloves prevent the hands against contamination. Our range is available in numerous shapes and sizes along with customised patterns. These gloves are disposable in order to avoid any kind of harm to the environment. Customers can avail our range at industry leading prices. Being quality oriented organisation, we offer Full Arm Veterinary Gloves. These are the most important part of the surgery kits. These gloves are quite easy to wear and keep the hands of the surgeons quite safe and free from any harmful bacteria. 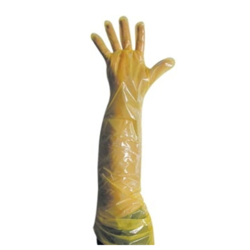 These gloves are used in the medical and food processing industry. Meanwhile, these full arm gloves are fully tested and customised according to the specification of the clients.